Even on a fine summer’s day, Southampton city centre can make the heart sink. WestQuay, BDP’s 17-year-old, £185m aquamarine-glass shopping centre looms unappealingly over the pedestrianised high street, Above Bar Street, where the homeless slump in doorways of empty shops. Combine that with myriad surface car parks, multi-lane roads and poor-quality post-Second World War buildings cutting off practically every view to the nearby estuary, and this port city of the south of England feels like the land that architects, developers and planners forgot. A new scheme hopes to rescue the area between Above Bar Street and the Solent. WestQuay’s developer, Hammerson, brought in ACME to turn one of those surface car parks into WestQuay Watermark. 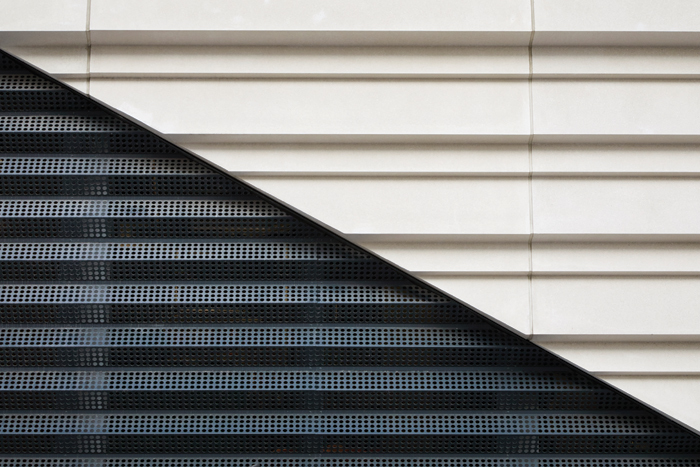 The £75m scheme started life with retail in it, but Hammerson’s analysis pinpointed a gap in the market for food, beverage and leisure facilities. So there’s 9,900 sq m of inexpensive restaurants including Zizzi, Franco Manca and Bill’s, with a 7,200 sq m, 10-screen cinema on top. 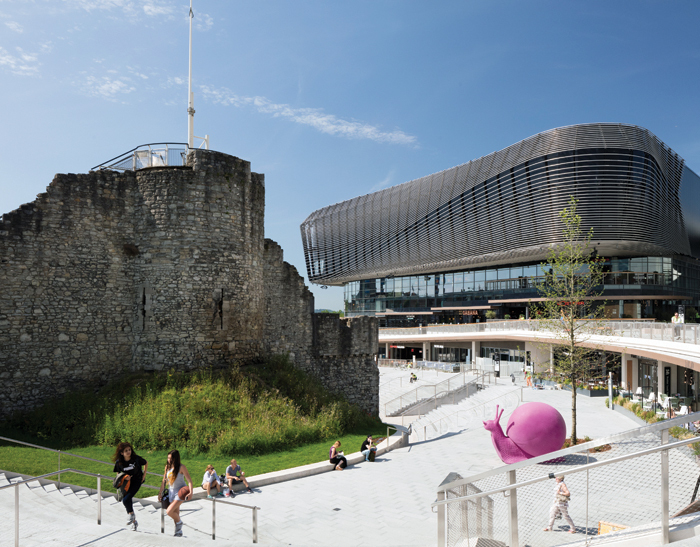 Hammerson wanted all the eateries, housed in a plinth of pre-cast concrete, to face Southampton’s important medieval defence wall. So ACME has given them fully glazed shopfronts, and has illuminated the wall for night-time diners’ delight. These venues are easily accessible from the new esplanade, which stretches in front of them to the wall and to the right towards the harbour. Above the plinth squats a larger, bulbous structure housing the cinema, which cantilevers out up to 26m. From the top of the urine-scented Catchcold tower in the defence wall opposite, the multiplex suggests the bulk of a ship’s hull, or perhaps a whale. The cinema’s bar area offers one of the few decent views of the estuary over its ‘prow’. The cinema’s outer skin is a continuous 14km-long band of 76mm-thick steel pipes (in reference to the Pirelli factory that once made underwater cables on the site). These pipes are echoed in the horizontal bands of the plinth’s cladding below. The most challenging element of this project was to deal with the 7m difference in height between the Old Town — meaning the current city centre — and the reclaimed land west of the Town Walls, where the site is. Such a change in level means pedestrian access has not been easy between the two areas. To overcome this, ACME has introduced two sloping promenades. These routes gradually bring pedestrians down to a terraced, bleacher-style sweep of steps that look on to a new esplanade. ‘It should not be any conscious decision coming down the stairs,’ says ACME director Friedrich Ludewig, ‘so the staircase is not a decision but an auditorium.’ The hope is that this will become a new public realm, and Hammerson is responsible for planning events there. On the day Blueprint visited, the esplanade was populated by a handful of 2.4m-high neon snails, against one of which a security guard leaned. The area’s ground-level water jets — which should lure young families down, if the snails don’t — can be covered over by an ice rink in the winter. The esplanade, which continues in parallel with the town walls, now totals 2.1 ha, and will eventually reach to the waterfront. In the next 18 months, ACME and Hammerson hope to start on site with Phase 2: a mixed-use site with housing, hotel, retail and more food and beverage. Bath-based landscape architecture practice Grant Associates has created some pleasing site-specific touches, including the randomly positioned seating made to resemble lost luggage, and a floor mosaic, whose intricate pattern represents the nearby mudflats. While no children were skipping through the fountains when we visited, the plaza feels like the most successful part of the scheme. Ludewig’s aim is to attract different audiences to WestQuay Watermark: locals; people leaving or arriving in Southampton by cruise ship or ferry and extending their stay in the city; and the city’s affluent catchment, who currently ‘don’t come into the town environment because it’s seen as value orientated’. If any of them have an eye for architectural detail, a love of the privately owned public realm, or an interest in medieval masonry, then Southampton now has something to appeal to them.